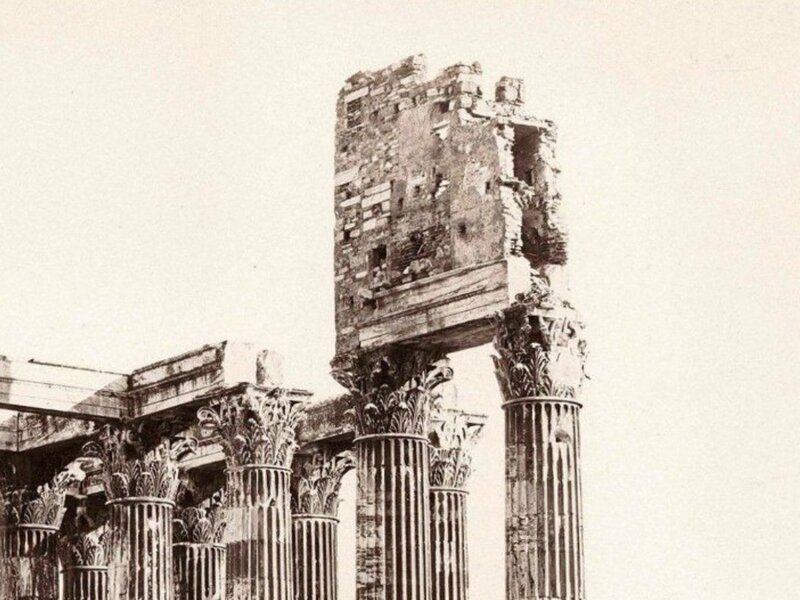 Looking at an old photograph of an ancient ruin, novelist and PhD student Paul Cooper noticed something strange — a protuberance that didn’t match the original design or current state of the structure. Normally, ruins are smaller, eroded versions of their former glory, but this one had something extra. Investigating this mystery, Cooper uncovered a bizarre history of adaptive reuse spanning millennia, involving fringe ascetics, modern politics and historical erasure. 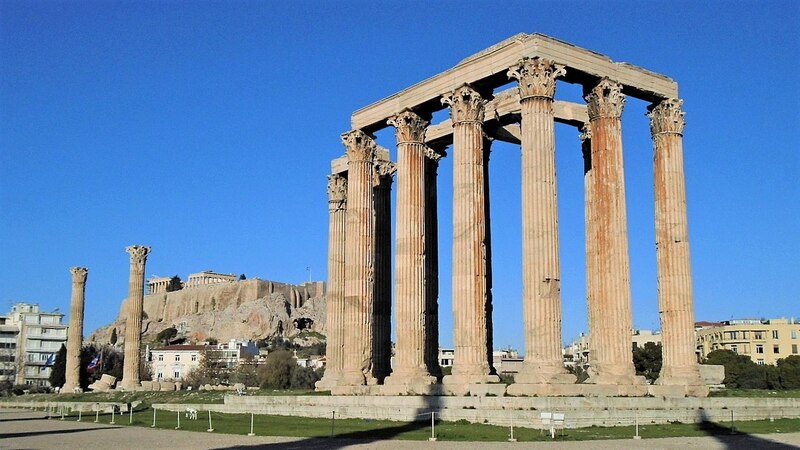 Construction on the Temple of Olympian Zeus began in the 6th century BCE, but the structure wouldn’t be completed until the rule of Roman Emperor Hadrian over 600 years later. 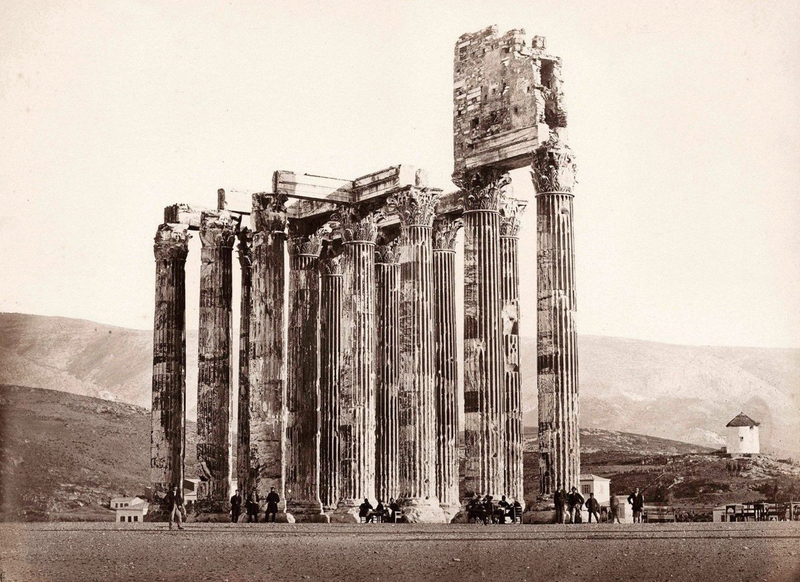 Located near the Acropolis in Athens, the building was sacked a century later and fell into disrepair. Normally, the story might end there, but, seeing an addition that failed to match modern design reconstructions, Cooper dug deeper. 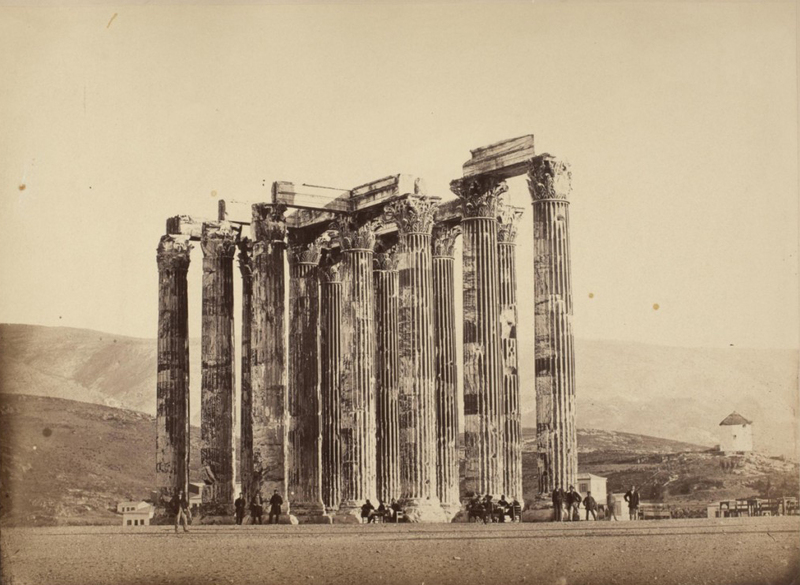 At first, he thought he had the answer when he discovered an “exact copy of the photo, but with the protuberance missing.” It showed all of the same people in the same positions, but there was “no weird lump on top.” This seemed to suggest the other photo had been edited, perhaps in an attempt to make the ruin appear larger and more grand. Still, Cooper kept digging, and found a painting by Johann Michael Wittmer from 1833. Apparently, the edit had worked in the other direction: someone had cut out the addition. Cooper would come to learn that this was an intentional attempt to scrub the historical record. 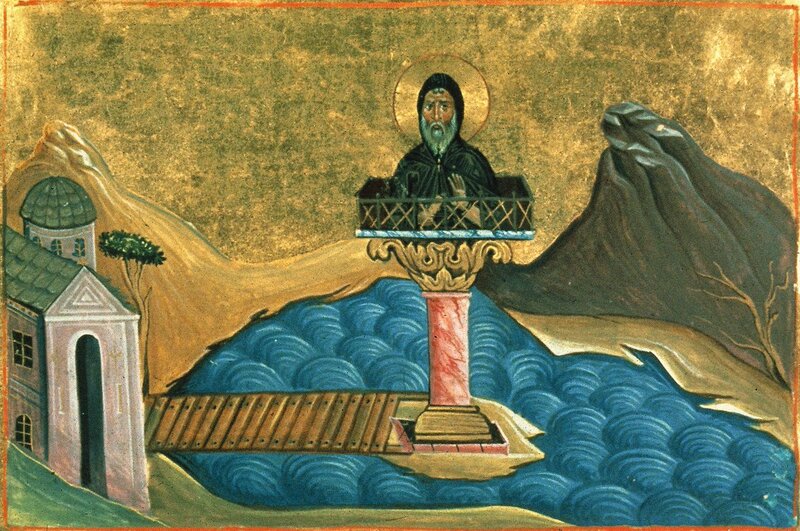 The first known stylite was Simeon Stylites the Elder who climbed a pillar in Syria in 423 CE and remained there until his death 37 years later. 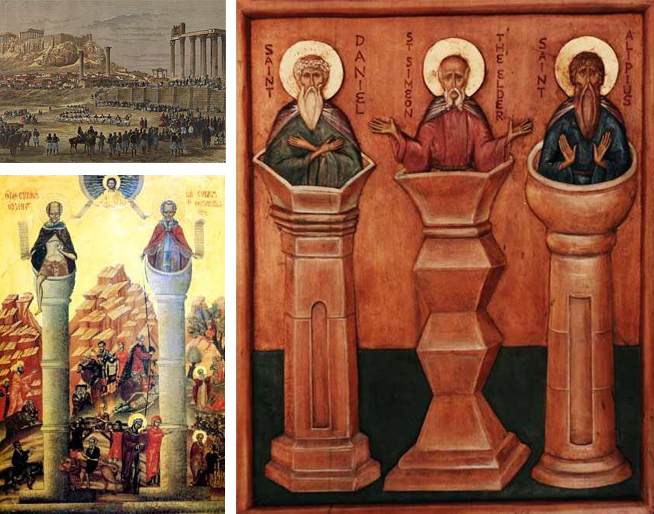 At some point, these stylites saw an opportunity in Athens and built one of their dwelling huts on the ruined temple, living aloft and getting food and water from below using ropes and baskets. 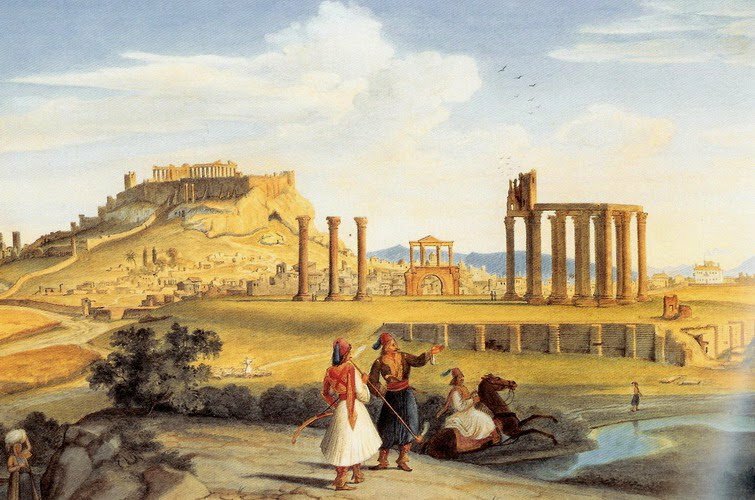 Later, “after Greek independence from the Ottoman Empire,” writes Cooper, “efforts were made in the 19th century to strengthen the national identity by harking back to the greatness of the Hellenic past.” So Greek authorities decided this get rid of this Christian addition. “It’s always interesting to see how ruins are used politically,” Cooper muses, and “how they construct and reinforce ideas of identity. When is a ruin ‘finished’? Who does the ruin belong to? Can a ruin be ruined?” Indeed, this is an ongoing challenge for architects and preservationists, particularly when it comes to countries with long histories and ancient buildings that have been reused and adapted over time. Follow Paul Cooper as he travels to explore other ruins, and be sure to check out our previous interview with him on the Green Colosseum. This reminds me of the great episode that Nate DiMeo did on The Memorty Palace, “Notes on an Imagined Plaque” (http://thememorypalace.us/2015/08/notes-on-an-imagined-plaque/). How societies later reinterpret past artifacts. Should the addition to the ruins be removed? Should additions to ruins be added? The answers to both questions questions look very different over different lengths of time. It’s always fascinated me how the ruins got reused throughout the history. I read somewhere that for the most part of the history, ruins weren’t considered as something to be cherished and that’s why it was fine to disassemble some old roman building and build a castle wall instead.